Learn how to upgrade or downgrade your Shogun plan easily using our dashboard. Changing your plan in Shogun is super simple. This can be done at any time via your dashboard. 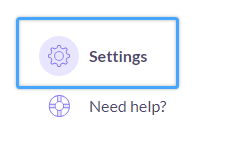 Simply open up your dashboard and head to settings in the bottom right of the dashboard. Then scroll down to "Billing" and under change plan you will see our available subscription levels with an upgrade or downgrade button.